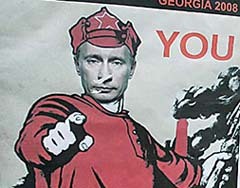 As the crisis over Georgia grinds on, a UW expert says he doesn&apos;t think Cold War rhetoric will ease tensions with Russia. Professor David McDonald , who chairs the History Department at UW Madison, says Georgia&apos;s leaders probably miscalculated when they decided to reoccupy their breakaway province of South Ossetia. Georgian President Mikheil Saakashvili "seemed to be getting good indications that he would enjoy at least some support" from the U.S. and NATO, says McDonald. U.S. aircraft were used to bring the 2,000 man Georgian contingent home from Iraq, which is likely to be all the help Saakashvili can expect from Washington. "In the short term, I think that it (reoccupying South Ossetia) has disastrously backfired for him," McDonald says. McDonald also doesn&apos;t think much of the tough talk and Cold War type rhetoric coming from the West: "if I&apos;m sitting in Moscow it seems to me curious to be getting reprimanded by other powers, who have shown over the last ten years that they feel no compunction about intervening in pursuit and defense of their own interests, in places as distant as Iraq and Afghanistan." McDonald cautions against relapsing into Cold War rhetoric, noting that the popularity of Russia&apos;s Vladimir Putin is based in large part on his insistence that Russia be treated with respect.